This was really just a quick “bonus” round as we only got to play nine holes here, so I get torn whether or not I should count it toward my full list of courses played. That said, from my brief experience here I will definitely plan to go play the full 18 (along with the other course) as soon as I can get back. 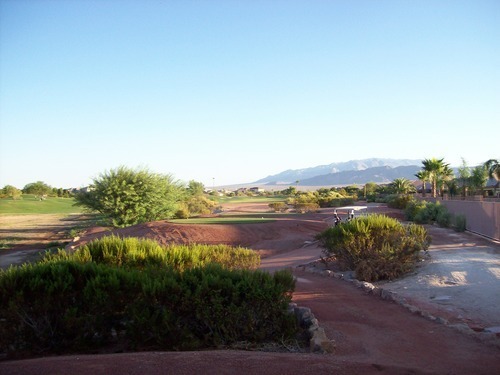 Note: I returned to Angel Park in 2017 to play the entire Mountain course along with Palm. Check out that review here. 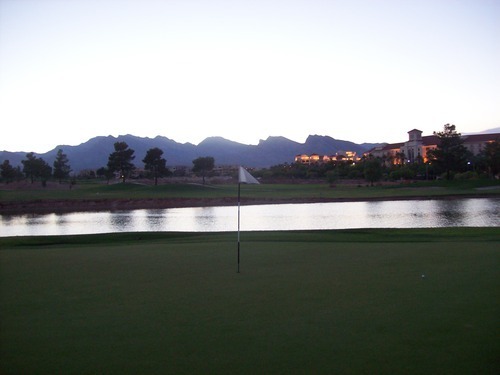 We teed off on the Mountain course a little after 6:00 and finished the 9th hole as it was getting dark around 7:30. It was a little hectic at the start as the first half of the front nine faces directly west and into the setting sun. The timing wasn’t great because it was brutal and hard to see where balls were going. 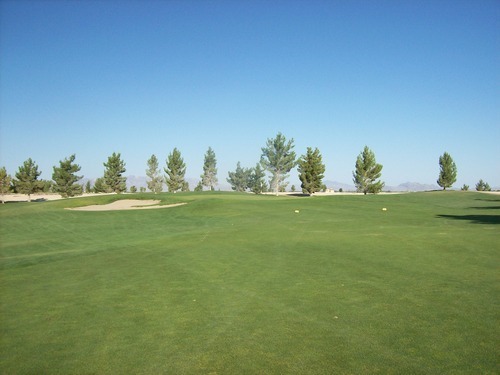 There was one hit I could swear I striped right down the middle of the fairway, but we never found the ball! Unfortunately, that made pictures a bit tougher, too, but I still pulled out a few good twilight shots. 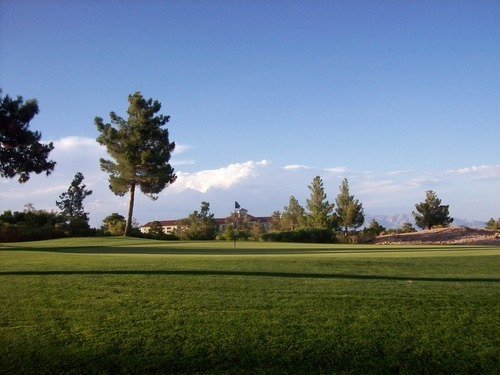 Angel Park is toward the lower end of Vegas courses in terms of price, but I found the whole facility to be very nice. They recently refurbished their clubhouse and bar area. 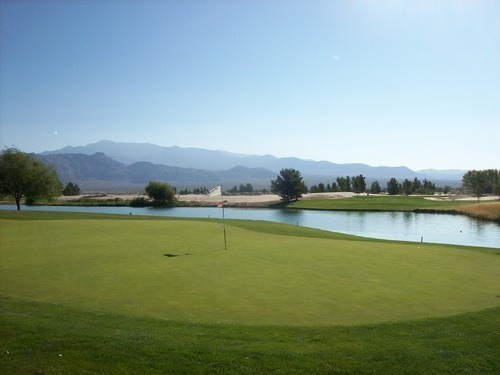 They have ample practice facilities. 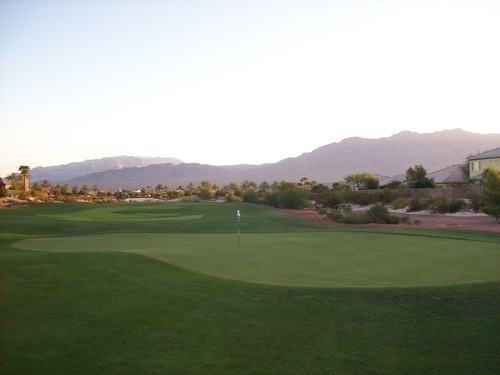 They have two full 18-hole regulation courses designed by Arnold Palmer (Mountain and Palm), a fact I was actually unaware of prior to playing. 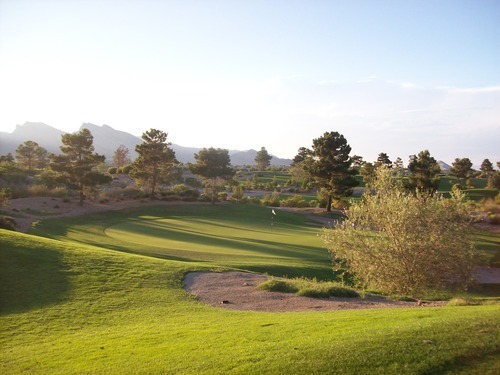 They have a night-lit par-3 course (Cloud Nine) and also a wonderful lighted 9-hole putting course that’s actually very challenging as it features sand traps, water hazards and some crazy undulation. We had fun playing that later in the evening. The reason we came out was to check out one of their “Hot August Nights” promotions. 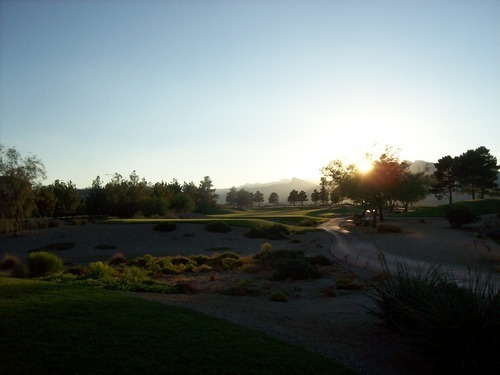 They have a band playing and they keep the lighted courses open a little later with some fun, games and prizes. It’s a very cool idea. Angel Park turned out to be a very pleasant surprise. The front nine of the Mountain course was in pretty good shape. 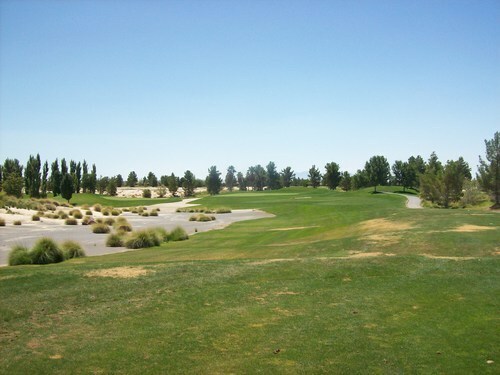 The fairways and rough were nice and lush with some burned-out areas here and there. The one sand trap I was in had good sand. The tee boxes were mostly level. 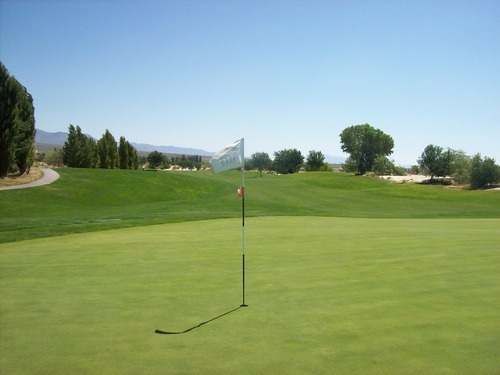 The greens were a little rough, though. 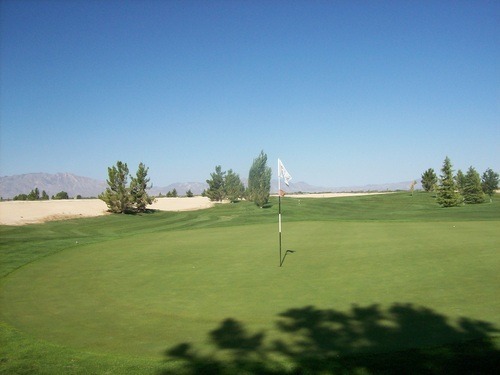 They were firm and pretty dried out, as well as slow on putts and with plenty of old ball marks. It seemed like the first few greens were not in as good a shape, but they got a little nicer toward the end of the front nine. Still not bad for late summer here (and at the very end of the day). I actually enjoyed the layout a lot and was impressed with the overall look and feel of this course. 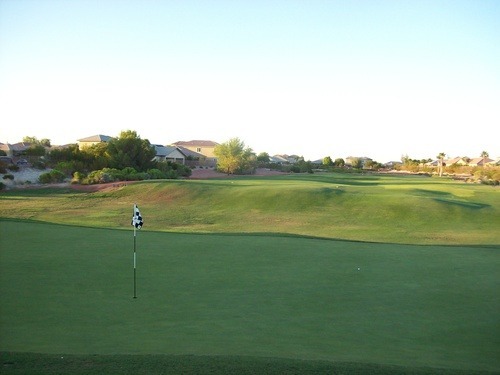 The first couple holes are nothing too exciting, but it gets much more interesting and more challenging as you go. 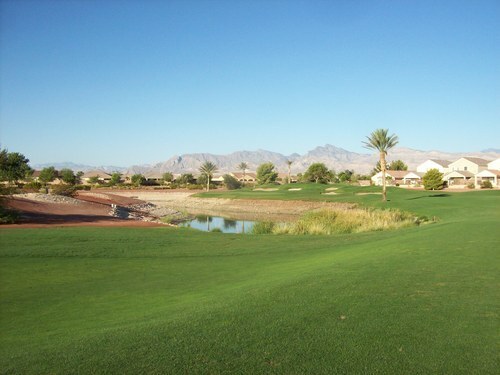 There are plenty of desert pines lining the holes and an enjoyable aesthetic presentation with a solid layout. 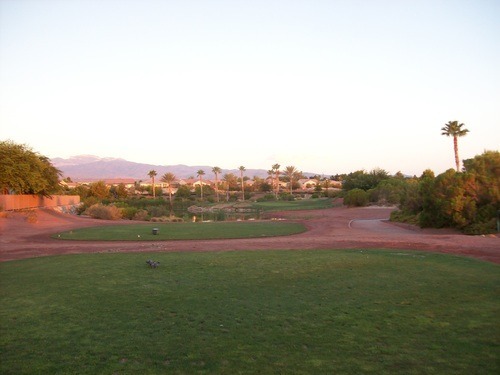 I definitely look forward to playing here again to check out the full Mountain course along with the Palm course, too. 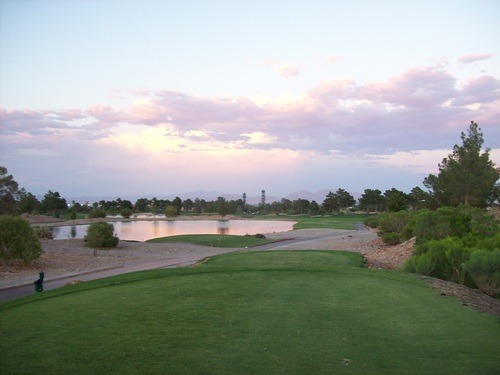 As a more reasonably priced course in Vegas, it’s a very nice option worth considering. 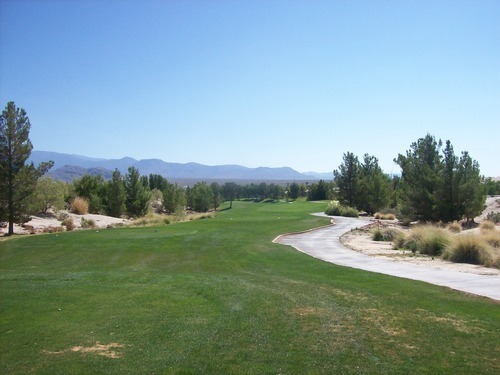 From what I can tell, this is the only course out in Pahrump, so it is definitely out of the way as far as golf goes. 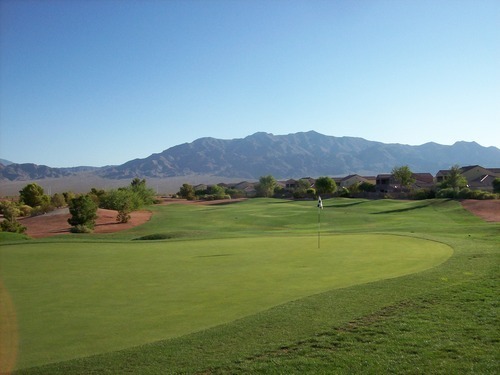 There are “other” reasons some guys will venture west out of Clark County, so whatever brings you out this way, Mountain Falls is a very worthy stop for a round of golf. From what I could see of the town, it doesn’t seem like a course of this caliber would get the support it needs to survive. For a Saturday morning, it wasn’t too crowded out there. I don’t expect huge crowds in the summer heat, but it still seemed unusually empty. It still seems to have done well despite some geographic hurdles. Originally, it was to be the centerpiece of a nice residential community. 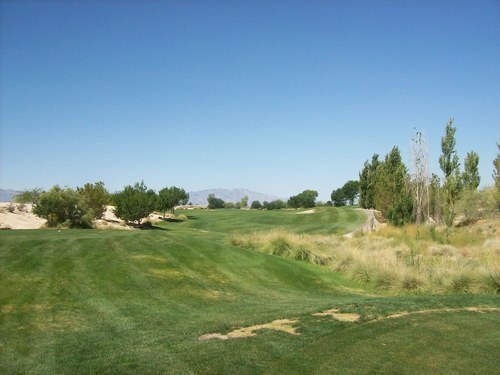 For that reason, Mountain Falls is currently two different courses in one. 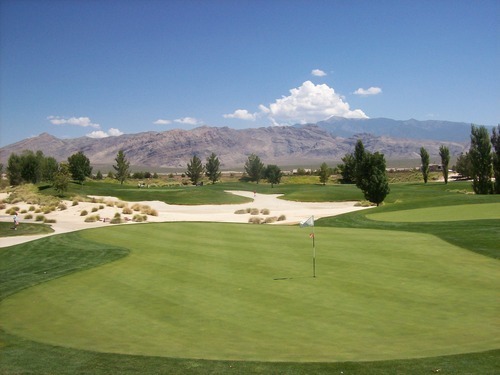 The front nine was designed by Jack Nicklaus’ group. It’s a bit more straightforward and forgiving layout from tee to green, but the greens (as is common on Nicklaus courses) is where the challenges lie. 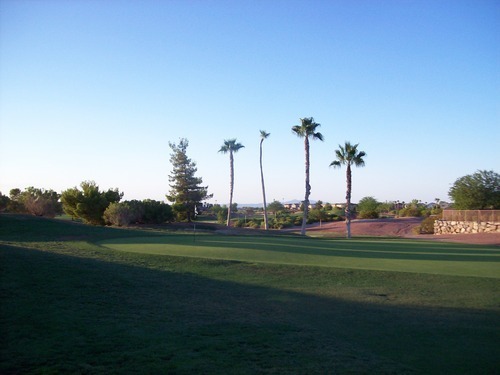 When you are standing on the fairways here and scoping out your approach to any given green, it always looks relatively simple from a distance. 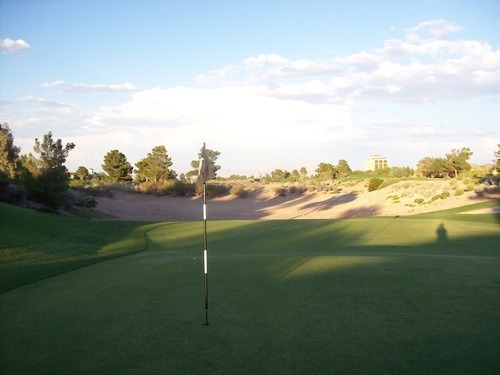 However, when you get up near and on the greens, you’ll discover they are much bigger than you expect and they also feature a lot more undulation and contours. Nothing is quite what it seems until you are standing right on it, so local knowledge does help. Luckily, we were playing with one of the key guys from Par-4 Golf Management, who manages this facility (as well as Silverstone, which I played Sunday and will be reviewing next). He helped us navigate what turned out to be a trickier course than seemed. 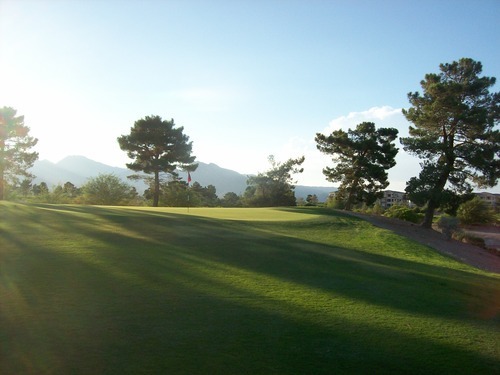 Beyond the edges of the holes, the front nine at Mountain Falls has an “unfinished” quality. There are no homes, but the land has clearly been graded for development. There are large flat expanses of bare dirt/silt/sand that aren’t that pretty a backdrop. There are some trees that definitely help to provide visual appeal, but nothing quite as mature as what you’ll find on the back nine. 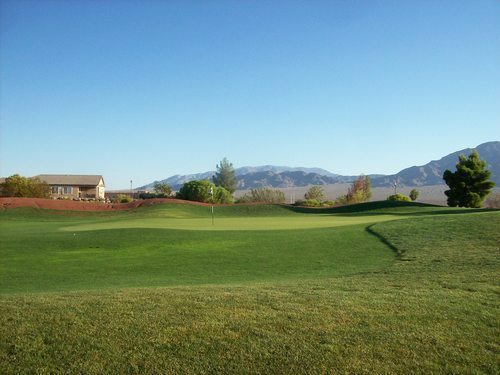 One nice thing about the front is that because of the “openness” around it, you get unobscured 360-degree views of the various mountain ranges surrounding Pahrump. So it’s not all bad things aren’t completely developed yet. 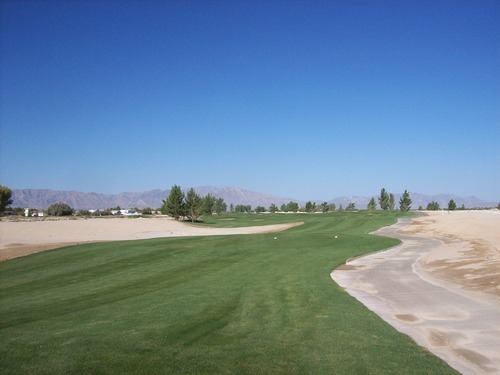 The back nine is a dramatic change both visually and in terms of layout. This side was designed by Cal Olson and his team and definitely feels fully realized. 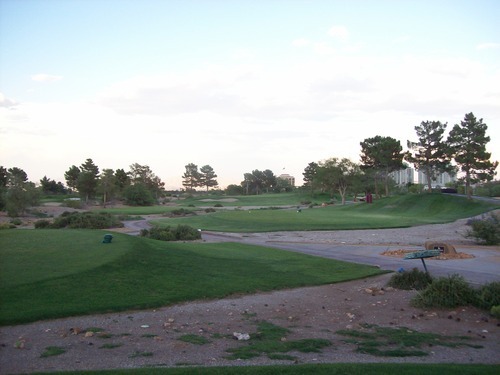 There are homes around the course, but they are not right on top of the holes and won’t come into play without a really stray drive. There are a lot more trees and the mountain views are more obstructed, but it just feels nicer throughout. 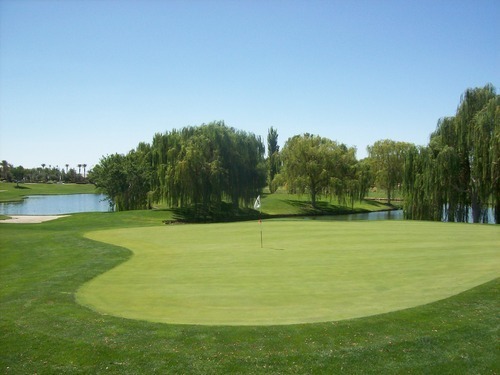 There are a number of water hazards with little water falls and some very dynamic green complexes. 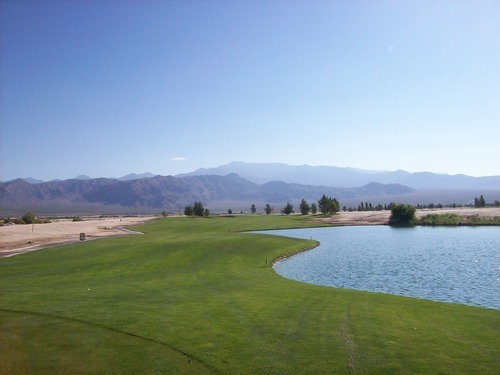 The most notable is the 18th hole. 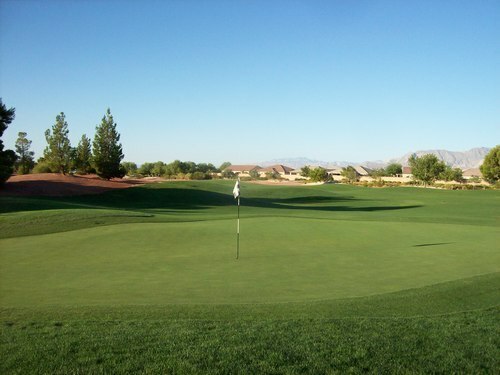 It’s a long par-4 finisher to begin with, but it features a gigantic butterfly-shaped green that is something to behold. I’m not sure how tricky they get with pin placements, but there could be some very difficult scenarios if it’s anywhere but the very center where they had it for us on Saturday. There are some slight elevation changes on the back, but nothing too significant throughout the course. Still, the scenery and setting are very nice. 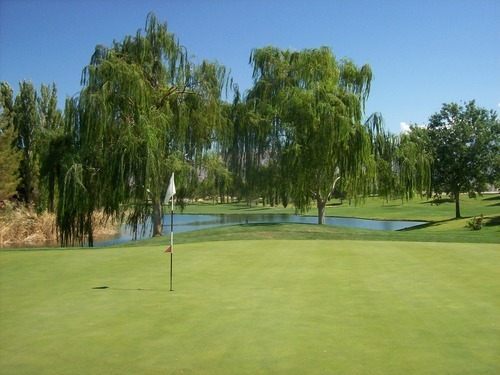 The course was also in very good shape overall for summer. 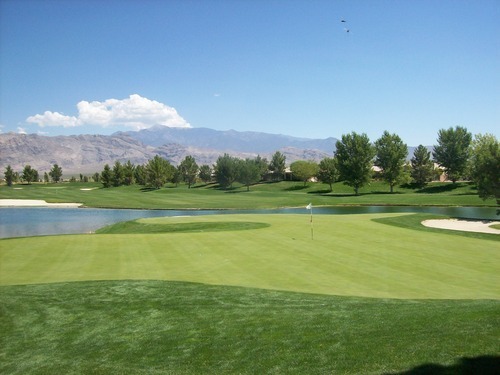 Mountain Falls is another Nevada course that does not do any overseeding this time of year. 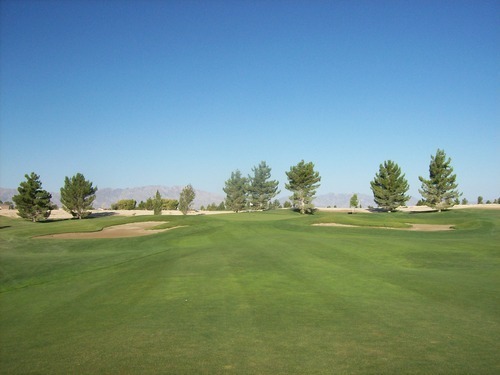 The fairways and rough were lush and green. There were some thin/brown spots scattered throughout the course, but nothing that affected play much. A few greens had some small spots where repair work was being done in patches, but the holes were kept away from those areas. 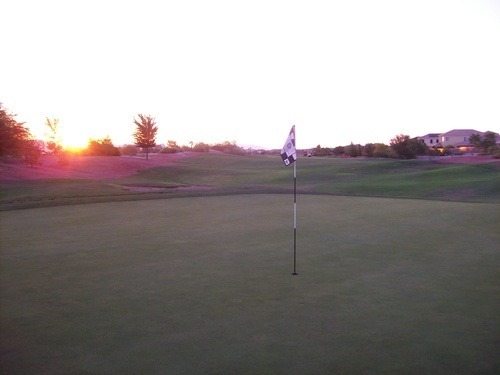 The greens were pretty smooth and firm, but much slower than they look. The bunkers were a little crusty on top, but decent enough. I would like to see a tighter cut on the fringes. They were too shaggy and putting was not much of an option even if you were just a foot or two off the green. 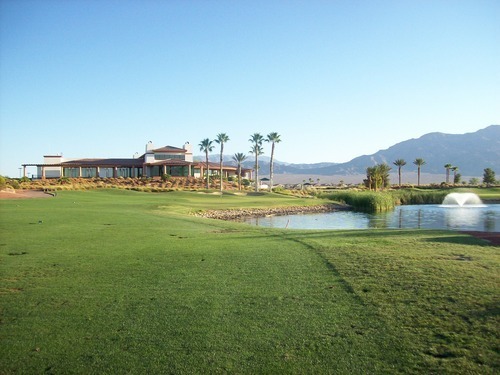 Once the front nine catches up to the back nine a bit more aesthetically, this will really be a gem of a course. 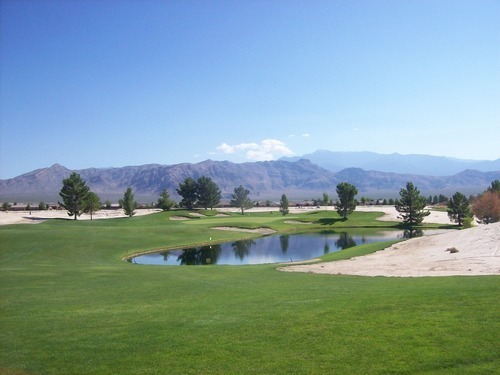 I’m not sure I would drive all the way out to Pahrump just to play it again, but if in town for any reason and you have time for a round of golf, it’s a must-stop. To be honest, I didn’t know much about this course coming in. 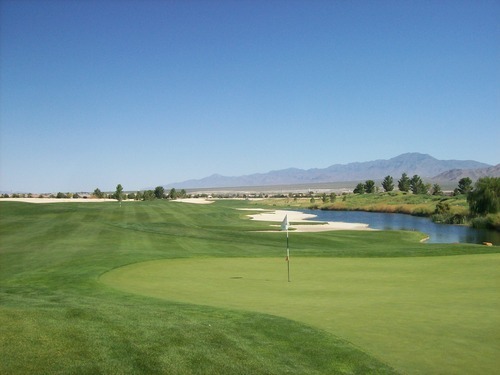 A friend helped me plan this trip out, and though he didn’t play with me Sunday, he recommended this course because it’s another one of the handful out there that doesn’t overseed. That means it is likely to be in better shape this time of year. This turned out to be a very enjoyable experience on a solid course. 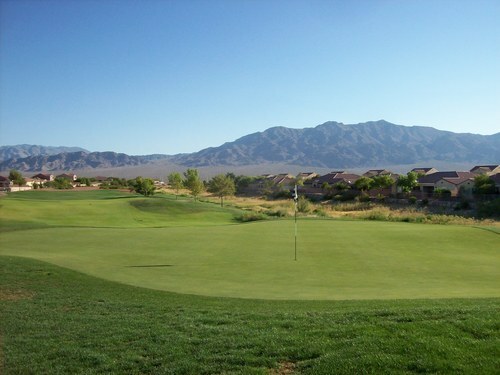 Silverstone is in the middle of a pretty nice residential community just northwest of downtown Vegas. 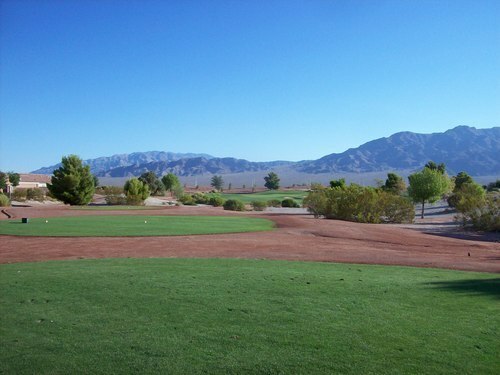 It features three nines (Desert, Valley and Mountain). 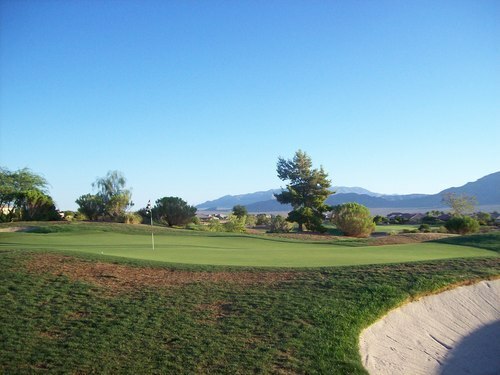 I ended up playing the Valley and Mountain courses. 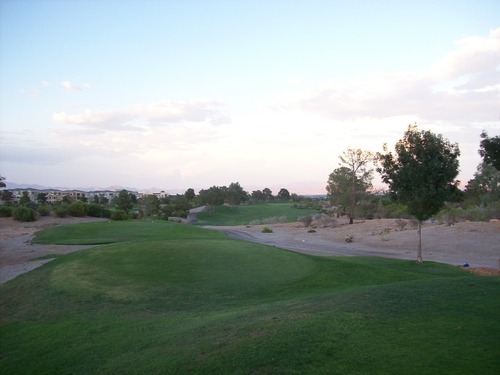 I teed off first by myself at 6:00 and zipped around the Valley nine quickly. I was expecting to run into some groups when turning to the Mountain nine, but it was also wide open ahead of me for a very quick dawn patrol pace. 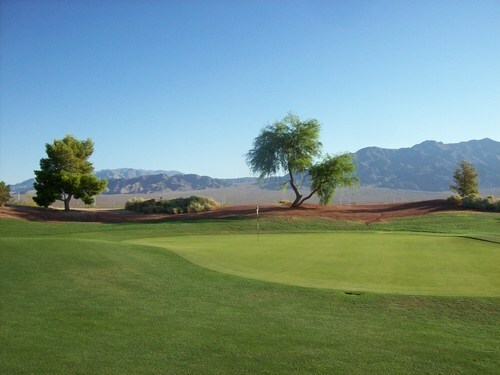 I had thoughts of maybe checking out the Desert nine while there, but I could tell it was pretty packed and I didn’t feel like dealing with slow play. 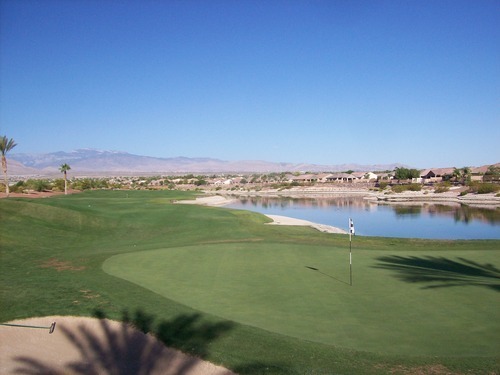 Silverstone winds its way through the community and houses line every hole. They are all nice desert homes, though, so it doesn’t detract much. Some can come into play with a wayward shot, but for the most part they don’t interfere too much. 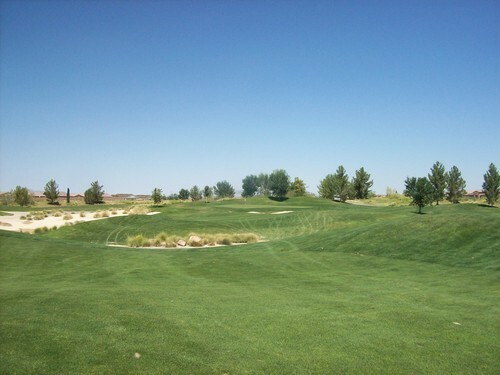 Like any good desert course, the tee boxes are individual cuts of grass separated by desert rocks, sand and bushes. They use a crushed red rock sand to line the holes here and that’s a very nice touch if you ask me. 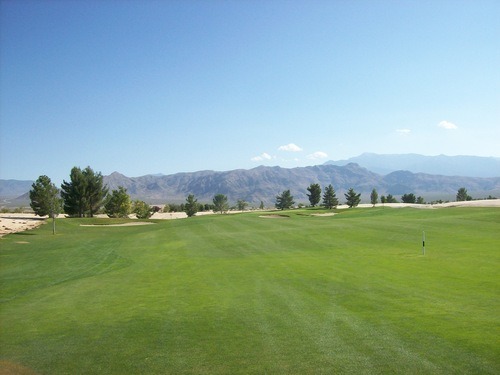 I played the blue tees that measure out around 6,400 yards when combining the Valley and Mountain courses. However, the layout doesn’t seem to play too long. On one hand, the ball does carry further here with the elevation and the dry, hot air. 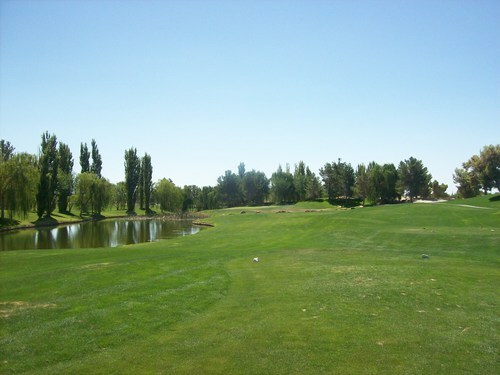 Still, there was only one par-4 over 400 yards and several under 350. None of the par-3s I played were super long either. 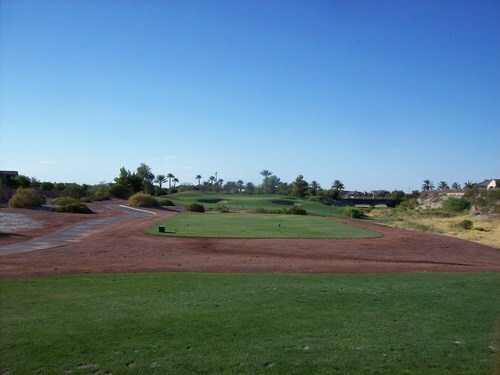 Where the added distance does come in is on the par-5s. 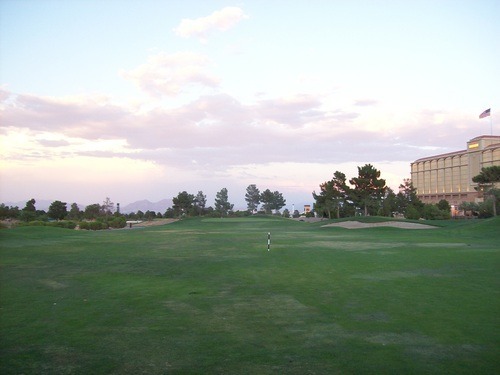 They are all pretty lengthy including the 3rd hole on the mountain course that measures out to 615 yards from the blue tees. The 9th hole on the Mountain course is a beast, as well. 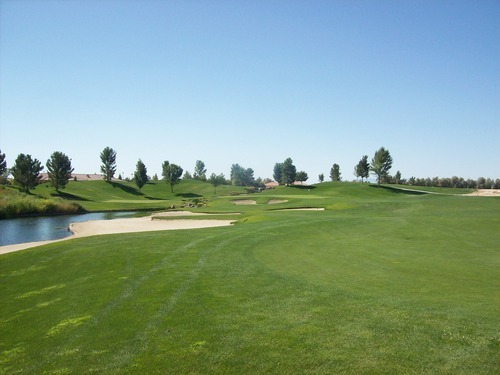 Beyond some tough par-5s, Silverstone is definitely not the most challenging course you will ever play. The fairways are pretty forgiving. 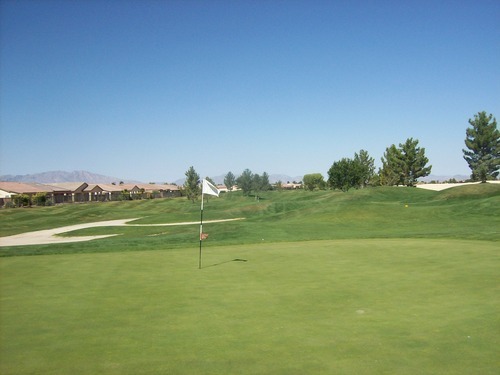 The greens aren’t heavily protected and don’t feature any severe sloping or undulation. 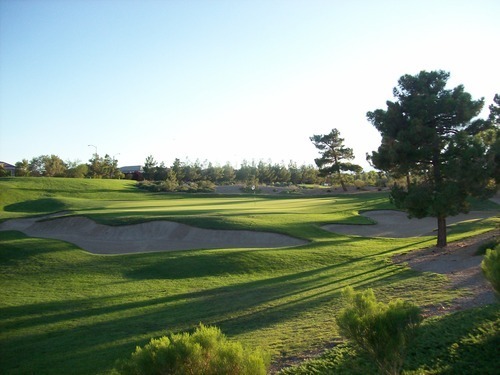 There is a nice variety of hole designs and shot shapes, though, so it’s not a boring course by any stretch of the imagination. It’s a very solid layout that will keep you fully entertained without beating you up too much. 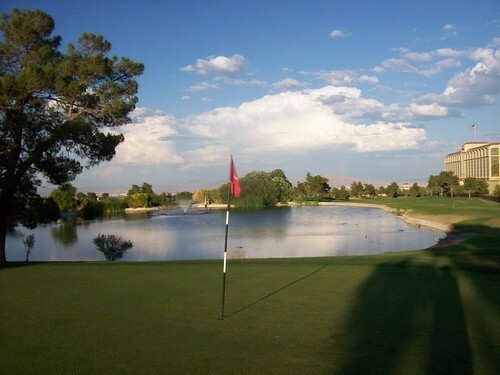 Silverstone is a very good looking course in a nice community with pleasant desert aesthetic touches, some trees mixed in with all the desert brush (including some palms for a Palm Springs feel in some places) and some water hazards throughout. 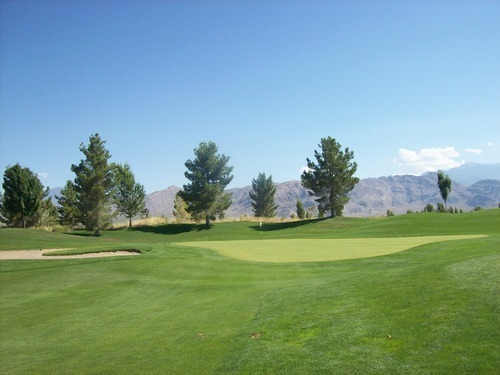 The course was in good shape overall. The rough was nice, green and lush throughout. The fairways had some big sections that had recently been resodded or spot overseeded. It was a different lighter color (and I think a different grass—bermuda? ), so it looked a little funny, but it played nicely. Whichever grass I was on in the fairways, I always had excellent lies. Everything was a bit damp in the morning, especially the bunkers, but there was good sand coverage in the few I found. The greens had good grass, but were a little beat up with unrepaired ball marks and old ball mark damage. A little unfortunate on what should be very nice greens first thing in the morning. Based on my limited experience in Vegas, it would seem Silverstone is a course that falls right in the middle of the road. It’s not the cheapest to play normally, but it’s not nearly as expensive as some places are out there. It’s not the most dynamic design, but it’s quite solid and enjoyable enough on all levels. 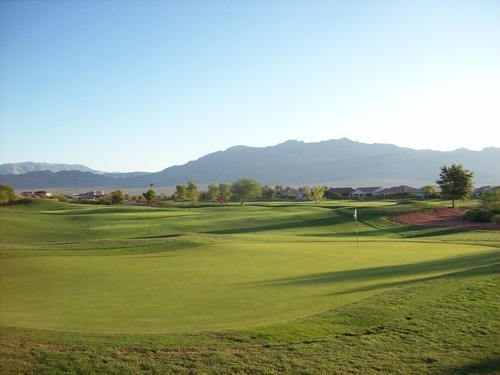 It’s a good course in a nice area where all golf courses are held to pretty high standards, so I wouldn’t hesitate to recommend it.